"They don't like it up 'em" to nick a phrase from the sadly missed Cpl Jones. 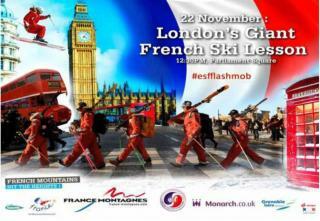 On 22nd November at 12:30pm, 200 Ecole De Ski Francais instructors are planning to flashmob in Parliament Square! It's a publicity stunt of course but I'm in favour of envoking The Police Reform and Social Responsibility Act 2011 which imposes tight restrictions on peaceful protest in Parliament Square. After Part 3 of the 2011 Act came into force on 30th March 2012, it became a crime to engage in a ‘prohibited activity’ in the Square where a police or local authority officer directs you not to do so. Directions to cease doing a prohibited activity or not to start to do one can last up to 90 days. I'm certain that anti-terrorism legislation can and should also be enforced in this situation. If you feel strongly that their stunt is actually some kind of warped peaceful protest connected to the ongoing dispute with tour operator 'guides' then it is your duty to complain to the police (my mate is a Met Police dog handler so I already have the wheels in motion), first of all explaining that you don't like Johnny Foreigner invading our sacred places and taking the p155 in this manner. I am in London that day so I'll be there filming. While you're making preparations, why not email Nick Griffin too ? element, my tongue was very much in my cheek. 200 ski instructors you say? In uniform? Piccadilly, apparently. I thought the idea of a flashmob was that it happened unannounced and appeared spontaneous. They've announced it and got sponsors on board like Monarch Airlines. Anyway, think it would be fun if those aggreived tour operators made it hot for them. Bode Swiller, Got me, haha! Snowheads flashmob, 22/11/12 12:30 Parliament square??????? Good luck to them. Have used ESF over the years and have no issues with them. emwmarine, but they do have an issue with a smallish British tour operator and they are currently prosecuting a case against them (see other threads for full details). Forget who is right or wrong for a second, at such a time it is the height of arrogance to stage such a stunt in such a place and they deserve for it to go massively pear-shaped IMO. but you'd almost certainly get arrested for doing so! Not a great state of affairs is it? I reckon Boris must have something to do with this. He probably gave the OK.
DG? You sure? Certainly has a certain ring about it. No it's not. It is no different to a UK company promoting itself in a Paris trade show. They have a large customer base in London and it looks to be an imaginative go at drumming up custom. There does seem to be some elements of anti French sentiment on here. The English have been beating the French for a thousand years, no reason to start losing now. March them straight to the Tower. It's specifically a go at the ESF, which just happens to be a French organisation, so not anti-French. A UK company paying for space to promote themselves at a Paris trade show is of course absolutely normal and perhaps you've chosen a poor example. However, Parliament Square is a place where lots of people would like to do some promotion (a peaceful protest is, after all, just the promotion of an idea or a point of view) but the law stops them and has forceably removed and criminalised many peaceful folks. So, I'd like to know who has allowed this and whether or not it has actually been officially rubber stamped and if money has changed hands. Thanks, cathy, and thanks also to the snowHeads call center (sic) in Bangladore which helped me post the photo above. I gather that Swiller made the same call but was incapable of following the instructions. Boredsurfing, Spyderman, Axsman, thank you! ... at precisely 12 noon next Thursday, before the division bell sounds (see text) and drunken members of parliament - along with sundry slushNuts - stagger from the premises to vote on the unlikely legislation permitting promotion of French ski instruction on Parliament Square. Comedy Goldsmith, your country needs you and you return. A miracle. I'm going down the pub to spread the news. Comedy Goldsmith, Booked my tickets....... cleaned my FIS kit........... I'll act as intermediary with MI5. I'm humbled, Swiller, but hasten to remind you that the annual flashmob of the Ski Club of Great Britain will be held only 6 hours later. This organisation, which has endured two world wars and a public chat forum, can call further votes and resolutions on the day to defend our national freedoms. Above all, the commanding statue of Sir Winston Churchill will remind the French exactly where they stand and slide on Parliament Square. I would love to see the ESF "Flashmob" (bollx...flashmobs are a surprise) disrupted. ESF are at the forefront of trying to prosecute a UK company for unpaid guiding, a service I have enjoyed many times over the years. We are supposed to be in a "unified free trade Europe" and yet the ESF come over here to promote themselves like that. Sod 'em. "this is one of the most awe-striking periods in the long history of France and Britain. It is also beyond doubt the most sublime. Side by side, unaided except by their kith and kin in the great Dominions and by the wide empires which rest beneath their shield - side by side, the British and French peoples have advanced to rescue not only Europe but mankind from the foulest and most soul-destroying tyranny which has ever darkened and stained the pages of history. " He was talking about an Austrian, the homeland of which seems to escape the vitiol sometimes evidenced here. emwmarine, WSC also suggested that France and Britain should become one country.